Real Techniques makeup brushes are among the most popular brushes among beauty buffs, primarily because they are affordable and more importantly, function very well. 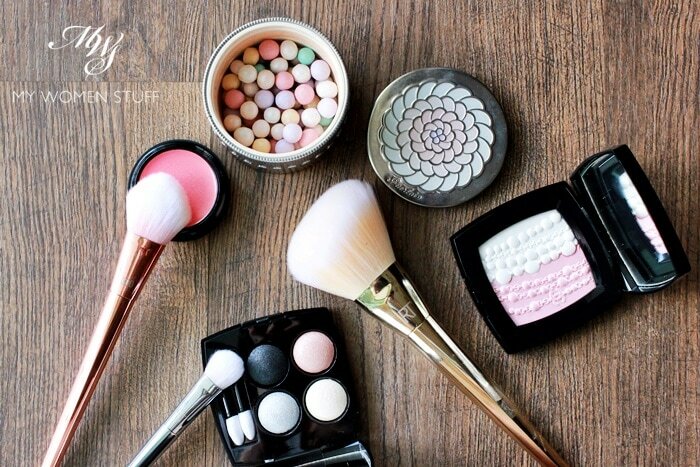 While I don’t own nor use any of their eye brushes, I do enjoy using their face brushes for blush and foundation. They’re soft and dense and do a good job, while being fairly easy on the pocket. I suppose it was a matter of time before a new luxe line appeared. I remember the buzz when the new Real Techniques Bold Metals range of brushes was launched. They were pretty to look at, but much to everyone’s surprise, not light on the pocket. That resulted in a rather polarised opinion on these brushes. While some loved them, and how pretty they looked, others felt that they weren’t up to mark and were too expensive. So, what makes these Bold Metals brushes different from regular Real Techniques brushes? How they look, for one. The Real Techniques Bold Metals brushes have longer, tapered handles coated in metallic paint. The colour of the handle corresponds to the brush’s use – Gold for the face, Rose-gold for cheeks and Silver for the eyes. I find that they have a decent heft, but the longer handles are rather more cumbersome, especially for those who have to go near to the mirror. If you store your brushes in beads or a container, I can imagine that the paint will scrape off over time and it won’t look so pretty anymore. While I’m not personally fussed, this is something to note if you like your things to look pristine. The synthetic bristles are white, with bases tinted with the corresponding colour to the handles. All this lends to a very pretty looking item, and the bristles are supposed to be more luxe and of better quality. I’d say it’s pretty debatable overall. I personally don’t find them particularly softer nor more luxe, but as I don’t have corresponding brushes in the regular Classic collection, I cannot compare like to like. There are 3 brushes in this set, one each from the 3 ranges. I’ll just quickly share some thoughts on each of the brushes before I tell you how I feel about them. #103 Angled Powder brush (Gold) Exclusive to this set – This is a very large brush with an angled tip that is meant for brushing on powder. I find that they made the head quite dense, so while it can pick up powder quite easily, it can and will likely also deposit too much product or deposit product unevenly on the skin as compared to a fluffier head. I find that this brush sometimes moves my foundation/concealer around a little more than I like. So I recommend using a light hand, and holding it further back along the handle, for a lighter touch on the skin. It is very soft and comfortable, without being scratchy or pokey on the skin even if you dab, but it can deposit product too thickly. Just be warned. If you’re more adventurous, you might even be able to use this brush for applying wide sweeps of bronzer or contouring. #200 Oval Shadow brush (Silver) Sold separately $16 – This is a rather large, dense, shadow brush with a rounded head that I find a little too large for those with small lid space like me. Because it’s fairly dense, it will pick up and deposit product in quite concentrated areas and quantities as well, so I’d only use this for applying single base shades all over the lid. It makes it a quick job to apply base colour and blend out the edges, on days I feel lazy. Line and I’m good to go. This too is fairly soft without being scratchy at all. #300 Tapered Blush brush (Rose Gold) Sold separately $24 – Again, this is a fairly dense brush, with a tapered head that is meant for applying blush. I found that when I use this with powder blushes, it would deposit colour too strongly and unevenly on skin, unlike when I use other more fluffy (but dense) brushes. It seems to work better with cream blushes, and the rather small head allows for precise application just where you want the colour to go. You can also use this to deposit contouring colour, as it is pretty precise. To give you an idea of the size of these brushes, here’s how they look when I hold it up to my (not small) face. You may notice that #103 and #200 are fairly large, while #300 is a little smaller than I’m used to for a blush brush. I have other blush brushes that have smaller heads as well, but they are more fluffy, so I find they diffuse colour better. This #300 Tapered Blush Brush needs more work, in my view. 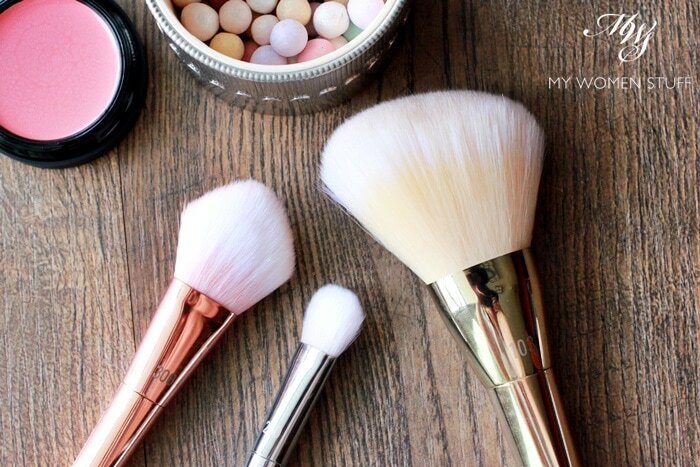 Are Real Techniques Bold Metals brushes worth the price? That’s a loaded question to me. This set was US$49 (approx RM203 at today’s exchange rate) for 3 brushes. I think that’s fairly reasonable, if what you’re in the market for is decent quality, dense, synthetic makeup brushes for a variety of uses. They aren’t very portable due to their length, but they do the job they’re intended to do. The #200 and #300 brushes retail separately for US$16 (RM66) and RM24 (RM99) respectively, which I’d consider a little pricey because I wasn’t too crazy about either of them. The #200 Oval Shadow Brush is a little large, but it can do double duty for spot highlighting, if that’s your thing. Otherwise, I’d probably get something else from Zoeva or Sigma at a lower price. My personal choice would be to just get the MAC 239 brush (US$25 | RM116) which I love, and is a better sized brush IMO. Pricier yes, but will be much more practical in the long run. As for the #300 Tapered Blush brush, I’m just not much of a fan of the shape or density. For blush brushes this small, I prefer something a little fluffier, because I use a lot of powder blushes and I want to get it right, off the bat without having to do any extra blending. For cream blushes, I actually prefer the Sigma F84 (which I’ve been meaning to blog about for years and keep forgetting 😛 ) or you could also get the Real Techniques Expert Face Brush (US$9) and use that instead. It has a similar density but with a little more give for blending. As far as the prices go, I’d say they aren’t exactly bank-breaking. If you’re used to buying Japanese-made natural hair brushes, these are a bargain and a half, which might have you wondering what the fuss about price is about. But if you’re on a budget then, I personally feel that while I don’t consider them expensive, I won’t consider them affordable either, because based on these brushes I have, I think there are better options out there for similar, lower or even just slightly higher prices. My experience with the Real Techniques Bold Metals brushes is in the limited edition Essentials collection. I find the brushes lovely and dense and soft. However, #103 and #200 are a little too large, I feel, while #300 is a little small. The dense bristles are both a boon and a bane, as they pick up a lot of product, but they can also deposit product too unevenly if you’re not careful, and can be hard to blend out properly. Price-wise, as a set, I thought it was fairly affordable. But individually, I feel that there are better options out there. They are decent brushes, and thus, not mere hype, but not the best in its price range. While I consider these brushes a little maligned, as I came across a lot of dissatisfied reviews of this range, I think the primary reason is because we’re all so used to the very affordable classic range of the Real Techniques brushes and how well they work out to be. Taken on their own, I think the Bold Metals brushes are pretty decent brushes. But in this price range, there are many other options available which puts these a little out of their league. Do you own any Real Techniques Bold Metals brushes? Are you in love with them and do you consider them expensive? I didn’t mind getting them in this set, although I’m not in the market for anymore from the Bold Metals collection. My personal preference in makeup brushes lie in natural hair brushes, so if I were to get any more makeup brushes (like real. I’m not even a makeup artist and can’t justify buying more! LOL ) I’d likely turn my attention to natural hair brushes 🙂 Do you like these? I have he 101 Triangle foundation and the 301 Flat contour – which I got a friend to purchase in the UK when she was there on holiday….and boy was it expensive!! The flat contour is something I use when I occasionally contour and it is soft and works well but picks up too much product. The 101 is a nightmare….the bristles are plasticky and I just cannot wrap my head around how it would work well in applying foundation smoothly. Sigh….will have to try it ‘one day’ I suppose! Individually, the brushes are way too expensive, I’d agree. Also, I find the quality just not up to par for the price they make you pay! I saw pictures of that triangle brush but I think it’s a but like reinventing the wheel – there are other shapes that work (flat and round) so why bother, really! 😛 But you are also right about the plasticky feel of the bristles. I thought it felt that way at first too – like fibres. But after I washed them, it was much better. I’m not crazy about them but at least they don’t poke me. Haven’t tried anything from this line – I’ll stick to the classic line based on your review. Not that I need more brushes, lol. What I got was another set of RT’s bold metals collection. Spotlight essentials according to the box… It consists of the 300 tapered blush, a 102 triangle concealer and a 203 tapered shadow. Have you tried these? I bought it because they look chic and because they come with a white faux leather clutch (which smell plastic-y and I had to soak and handwash it)>_<"
You're right- 300 is probably NOT for brushing! On the other hand, 102 is a tapered brush with a flat edge for highlight and an angled edge for contouring around the eyes and nose. I find the flat edge a bit too big for applying highlight and the angled edges too sharp to make the contouring look natural. 203 is a smaller tapered brush for blending eye-shadow. It's so fluffy that it kinda smudges everything. That's just me tho. Have u tried the 102 and 203 brushes? What do you think of these? Hi, I’m afraid I’ve not tried the brushes you mentioned, but I personally wouldn’t be buying anymore from this range because I think they’re crap 😛 I’d stick to my regular brushes and here are some I use most often. 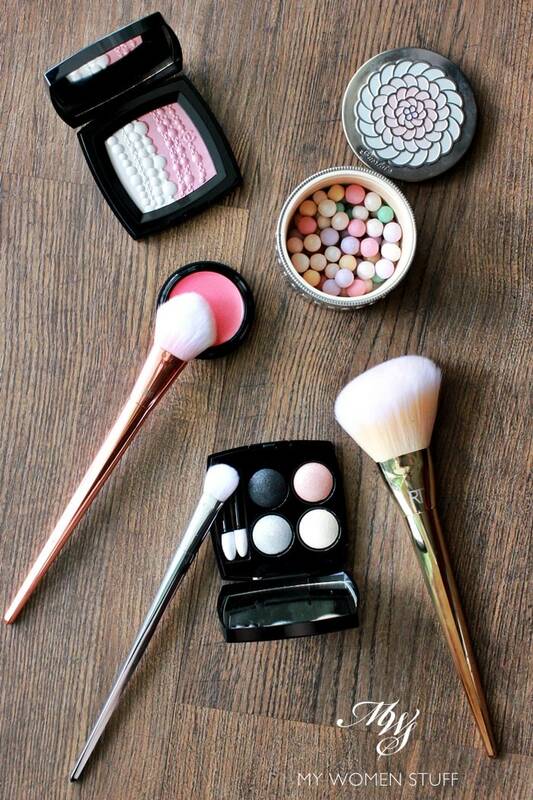 The blush brush was what I intend to buy, for the Guerlain meteorites (the pink brush is indeed scratchy!! but so nice looking…). I then ended up buying the bold metals collection for their sleek design. I really should stop buying things that are only pretty, haahaa.